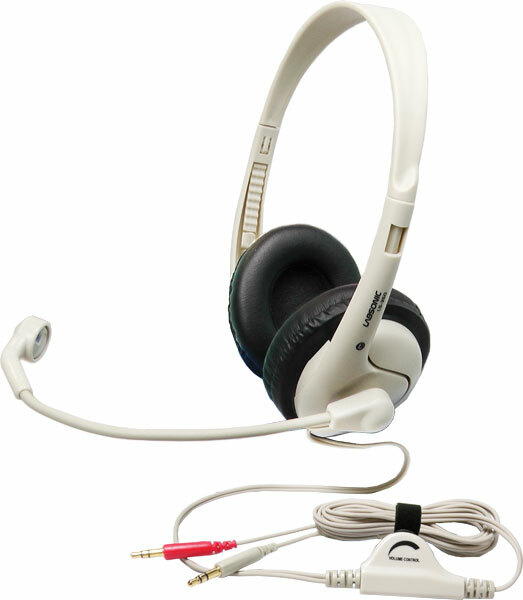 The popular Labsonic LS355 Stereo Headset now comes in a tablet-ready model. The LS355-M comes with a 35TRRSM adapter that works with any single jack tablet, smartphone, or other mobile devices including: iPad®, iPhone®, iPod®, iOS®, Android®, Kindle®, Kindle Fire®, Galaxy, Kuno, Kineo, and many more! Remove the adapter to use the headset where separate headphone and mic jacks are required (i.e. computers, tape recorders, etc.). The tablet-ready lightweight LS355-M features a flexible boom microphone that adjusts easily to accommodate students of all sizes. Adjustable headband fits both children and adults, and soft leatherette earpads provide long lasting comfort throughout the day. Shielded cord features an inline volume control for ease of access. Dual 3.5mm plugs are compatible with any computer or device that has both a 3.5mm headphone and microphone jack. And with the included adapter, you can now plug in the LS355 to any single-jack tablet, smartphone or other mobile device.